New Caledonia hotels. - Hotel videos, user reviews, cheap booking! Showing 1 - 10 of 21 best hotels. | Sorted by rating. Situated amongst a tropical garden, Les Cases de Plum offers air-conditioned bungalows with free Wi-Fi access. You can relax on a sun lounger by the swimming pool or the beach is just 50 metres away. Hotel Le Lagon offers accommodations just 110 yards from the Anse Vata Beach, Noumea. A spa, a swimming pool and free Wi-Fi and are available. 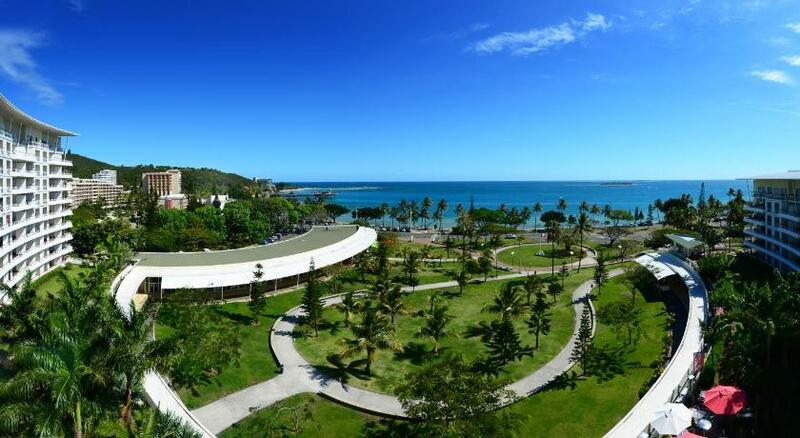 Hilton Noumea La Promenade Residences is located on l’Anse Vata Bay in Nouméa. Located opposite Anse Vata Beach, Chateau Royal Beach Resort & Spa boasts a day spa, a tennis court, 3 restaurants and a fitness centre. Surrounded by the tropical gardens of the Nouvata Parc Complex in Noumea, Le Parc offers rooms with large private balconies with panoramic garden views. Free Wi-Fi is available throughout the hotel. Floating on a turquoise lagoon, L'escapade Îlot Maître offers luxurious accommodation with stunning garden and sea views. It has a private beach and an outdoor pool with a poolside restaurant. The Stanley Noumea is located on the water’s edge in the heart of Sainte Marie Bay. The outdoor swimming pool is surrounded by sun loungers and offers beautiful lagoon views. Located in the heart of Noumea, this hotel offers airport transportation services and free Wi-Fi Internet. It is just a 5-minute drive from the harbor, shopping and restaurants. Set alongside the beautiful lagoon of Oro Bay, Le Méridien Ile des Pins Resort offers direct beach access, a swimming pool and a day spa. All accommodation offer a private patio or balcony. Located 150 metres from Baie des Citrons Beach, Marina Beach Residence offers secure accommodation with a kitchenette and a TV. It is 5 minutes’ drive from the famous Lemon Bay.